The William Saroyan Foundation was established by William Saroyan to be the steward of his legacy: to preserve and promote his life’s work, and to support promising young writers as they advance their careers. "Good people are good because they've come to wisdom through failure. We get very little wisdom through success, you know." William Saroyan was a world-renowned writer of plays, short stories and novels, and one of the most highly esteemed writers of his generation. He burst upon the literary scene in 1934 at age 26 when his short story The Daring Young Man on the Flying Trapeze was published in Story magazine to critical acclaim, followed by the publication by Random House of a collection of short stores under the same name. Within four years he had published six books, and had three plays running simultaneously on Broadway. His career soared to stratospheric heights in the 1940’s, when he stood with few others atop the worldwide literary stage. 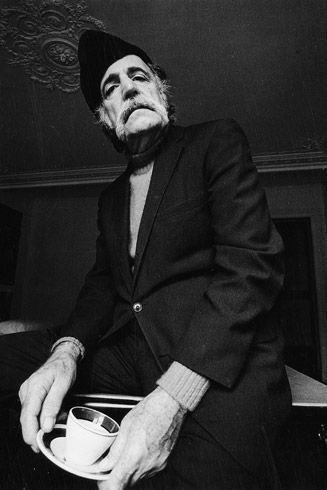 Saroyan’s work was awarded a Pulitzer Prize, an Academy Award, and the New York Drama Critics Circle award. He continued to write and publish prodigiously until his death in 1981. He left behind a body of work of hundreds of books, plays, short stories, poems, and songs. His work remains popular to this day. His literature is taught in schools to all ages, and his plays are produced all over the world. His Academy Award winning screenplay “The Human Comedy” was recently adapted into the motion picture “Ithaca,” directed by Meg Ryan. Saroyan is a hero to the Armenian people, in Armenia and the global Armenian diaspora. He was born in Fresno, California to parents who had immigrated from Bitlis in Western Armenia, now a part of Turkey. Saroyan’s writing and singular voice bore witness to the immigrant life in early 20th century USA, and to the Armenian experience in Fresno, in California and in the global Armenian community. "Although I write in English, and despite the fact that I'm from America, I consider myself an Armenian writer. The words I use are in English, the surroundings I write about are American, but the soul, which makes me write, is Armenian. This means I am an Armenian writer and deeply love the honor of being a part of the family of Armenian writers." Saroyan was also an exceptional visual artist, who produced a sizable archive of drawings and watercolor paintings. His abstract work was influenced by Chinese brush drawing, Abstract Expressionism as embodied by Jackson Pollock, and the calligraphic work of Mark Tobey. He created hundreds of pieces of art over fifty years. Today his artwork is owned by dozens of museums in the US, and by private collectors around the world.